Congratulations to the winner of the first Tree Town Chemistry photo contest! The photo and the original caption are below. Read to the end of the article to see the runners-up and other entries from this year's contest. 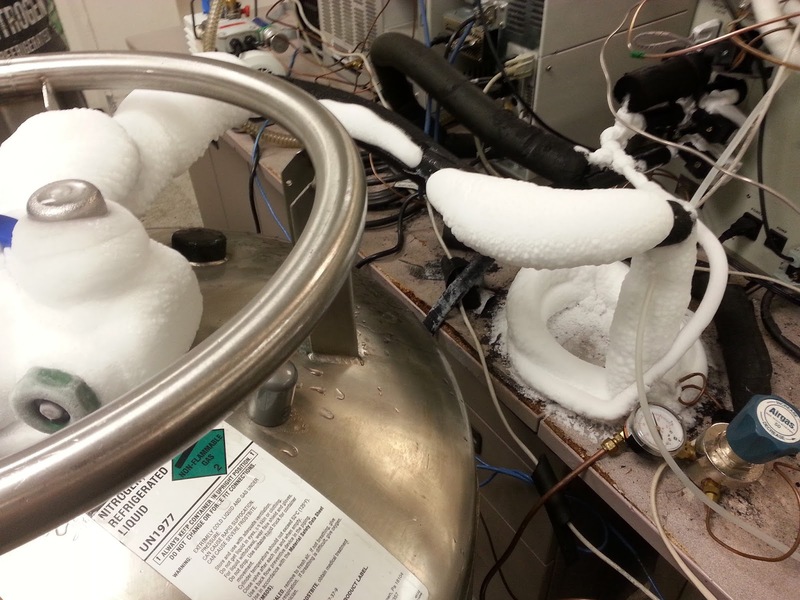 Every day in lab is a winter wonderland. I operate two gas chromatography-mass spectrometers, analyzing ambient air samples for toxic materials. Each system uses almost an entire tank of liquid nitrogen a day to cool the preconcentrator gas traps. The amount of snow and ice formed on the tanks and transfer lines each day are enough to have a full snowball fight, and once a tank is empty, it can take up to 24 hours to melt enough to swap out for a new tank. What is that you're breathing now? Is it clean air? Car exhaust? If your air is clean now in July, will it still be clean in December? Don't worry about it. Chemists are on the case. 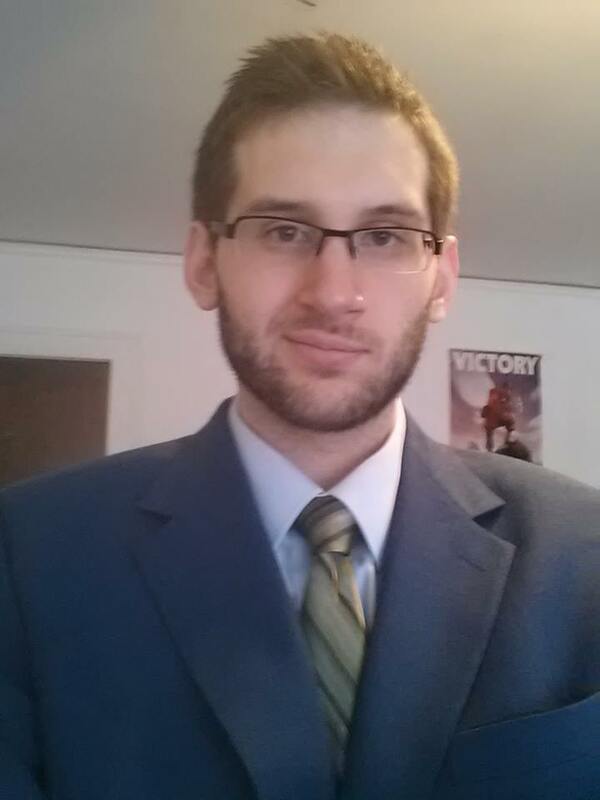 Dan Gardner, a recent M.S. Chemistry graduate of the University of Michigan, works in a Maryland Department of the Environment (MDE) air toxics laboratory that monitors air quality throughout the state. MDE works with the federal Environmental Protection Agency to keep an eye on the quality of air across the country. Part of the work of the Air & Radiation division of the EPA is to record levels of hundreds of air pollutants from locations all over the United States. In particular, the EPA watches levels of six especially important pollutants for which "national standards" - maximum allowable levels - have been established. Carbon monoxide, sulfur dioxide, nitrogen dioxide, dust, lead, and ozone are all regulated. Air monitoring locations for the EPA and for state-run agencies like the MDE exist all over the country. A team of scientists works at each one to collect samples of the air that we, all of our plants, and all of our livestock breathe. Samples can be collected in a few different forms depending on what they will be used for. Then the samples are carted off to the analysis labs. That's where Dan comes in. Samples from the sites come in at far too high of a concentration for analysis, so part of Dan's job is to carefully dilute the samples to a strength that the instruments can handle. He also prepares standards - samples with a known composition that are run along with the environmental samples - to ensure that the instrument is properly tuned. The team Dan works with is specifically quantifying volatile organic compounds (VOCs) in the atmosphere. These harmful compounds come from a wide number of sources but are most typically used as refrigerants or industrial solvents, or are produced as car exhaust. The EPA compiles the data and offers freely available air quality reports that show how the concentrations of all sorts of airborne pollutants change over time. What does the work? "I operate two separate gas chromatography/mass spectrometers (GC/MS). I run every sample on both of them and compare the results," Dan writes. The GC/MS is actually two instruments coupled together. Inside the gas chromatograph, a vaporized sample is pushed through a column by an inert carrier gas. The column is made of a material that separates the components of the sample based on some chosen property, most typically polarity. After flying through the gas chromatography column, the sample components reach the next step of the process at different times, which allows them to be detected independently of one another. In the case of GC/MS, the next step is a mass spectrometer, which ionizes the sample materials and measures their mass. A mass spectrometer was used by the Philae probe last year to answer questions about the origin of water on Earth. 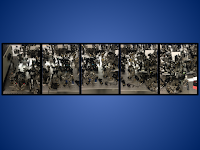 Mass spectrometers can also give structural information that is often critical in identifying compounds. GC/MS is a very powerful tandem measurement and is useful across nearly every discipline of chemistry. The work is all carried out according to procedures written by the EPA. "After the runs, I do a very basic look through the data to make sure it all seems reasonable and does not need to be re-run," Dan writes. He then hands off the test results to another member of the team that is responsible for doing a detailed analysis of the data. What you see in Dan's winning photo is the preconcentrator set-up for the GC/MS that he works on. "The preconcentrator is the fun part," he writes. "Since the concentrations of the components we are looking for are very small and many of them are volatile, this is used to compile enough in one place to be detected." The samples pass through the traps, which are cooled by liquid nitrogen to temperatures as low as -160 ºC. The cold temperatures force the volatile components to condense as solids or liquids and thereby prevent their escape until they're ready to be injected onto the column. "We go through a lot of liquid nitrogen. We go through 2/3 to an entire tank each run. Then multiply that by my two instruments and a third one run by a coworker... we go through a lot of liquid nitrogen." All that liquid nitrogen makes for some pretty frosty working conditions as water from the air is frozen onto the pipes. In fact, the ice condensing on the preconcentrator plumbing is one of the largest hang-ups Dan faces in his work. "By the end of a sequence, there's often 5-6 inches of snow and ice. Sometimes it's very powdery and can easily be swept off (or made into snowballs), but some days it's pure, solid ice and we have to take a mallet to it just to close the valve." The next time you step outside and breathe deep on a fresh, sunny day, send a thought to Dan and his teammates. You never know when all that ice will get the better of them. Jessica performs molecular dynamics simulations on receptor proteins in Dr. Charlie Brooks's lab at the University of Michigan. Research like hers helps to build accurate models of protein-pharmaceutical interactions and is an important part of modern drug discovery. 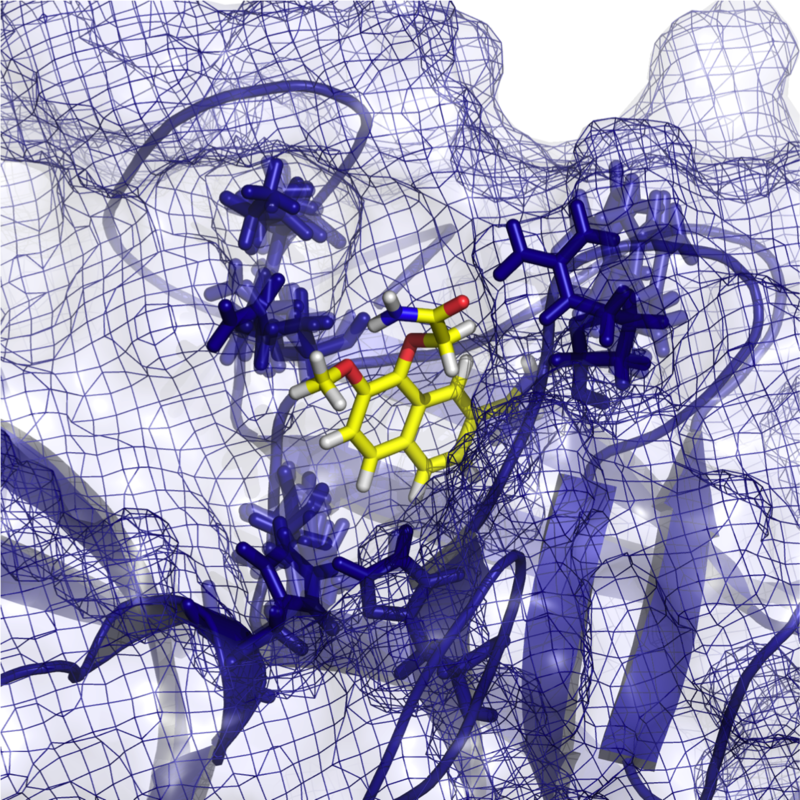 Protein-ligand docking has become a method integral to the drug discovery and lead optimization process. Proteins exist in an inter-converting ensemble of conformational states, but traditional docking methods kept the protein as a rigid entity for efficiency. To effectively and efficiently search the conformational space available to both the receptor and ligand I have implemented a mixed resolution approach of the receptor. As depicted in this figure, part of the receptor is represented as a series of grids while other regions are kept in an all-atom representation. This allows for ligand and receptor sampling to occur simultaneously without much loss of computational efficiency. Jordan is a 4th-year graduate student working with Dr. John Wolfe in pursuit of biologically active heterocyclic compounds. He studies palladium-catalyzed reactions with the goal of adding two different nucleophiles across a carbon-carbon double bond. Sometimes even the most mundane days can be opportunities to find wonder. 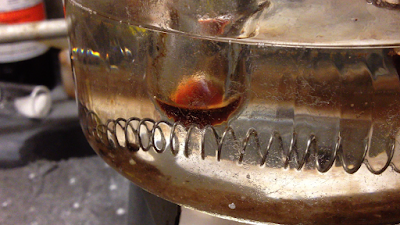 For example, I wanted to get a picture of my stirring reaction for my boss, so that I could show him my experimental setup. I ended up being able to capture the different viscosities of the oil bath in contact with the heating coil. SCIENCE! And finally, by popular demand, here are the remainder of the photo contest entries. Thank you to everyone who entered! Choosing a winner was difficult, and I'm looking forward to the next contest. Thanks again to Sung-Hei Yau and Emily Nelson for helping out with the judging. I am a two-dimensional infrared spectroscopist. This is a visual of the laser setup my lab uses to study solvent dynamics on a picosecond timescale. 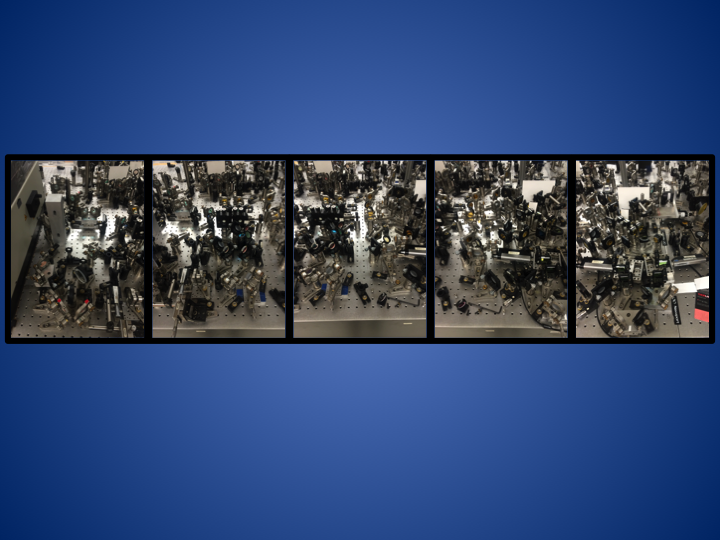 All optics shown are used to take an 800 nm laser beam and, through nonlinear optical processes of optical parametric amplification and difference frequency generation, produce four 2000 cm-1 infrared pulses. These interact with a sample and produce a signal field, which is converted back to visible light through another nonlinear optical process called sum-frequency generation. This is done so we can detect the signal in the visible region. 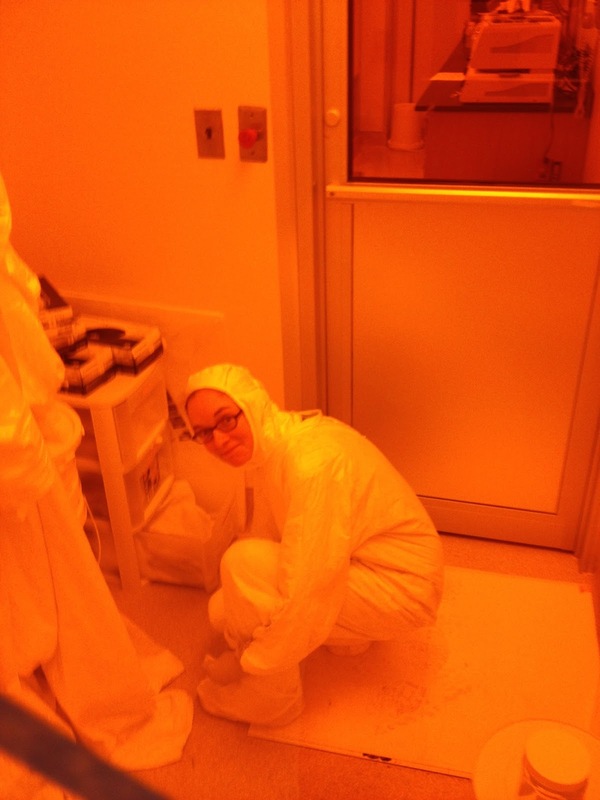 This technique is #distractinglysexy and I cry every time I think about it. This is an image of titanium dioxide. On the macroscale, this appears as a white powder. However, as demonstrated with this image, when using transmission electron microscopy it can be viewed at the nanoscale. Depending on the conditions in a synthesis, the morphology of a compound can be changed. The synthesis used to make this particular sample yields nanosheets. These are approximately 7 nanometers thick and 60 nanometers in length and width. The pattern seen on the sides of these nanosheets is due to the crystal lattice of the material. One can even determine distances between layers in a crystal lattice with this technique! This is the robot that I've helped design. It moves forward, reverse, rotates, and can slide sideways. We've designed the circuit boards that go in it which control the motors, sensors, and on board computing. 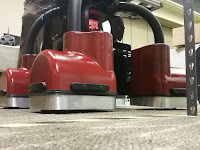 We created the drive control that allows it to move. 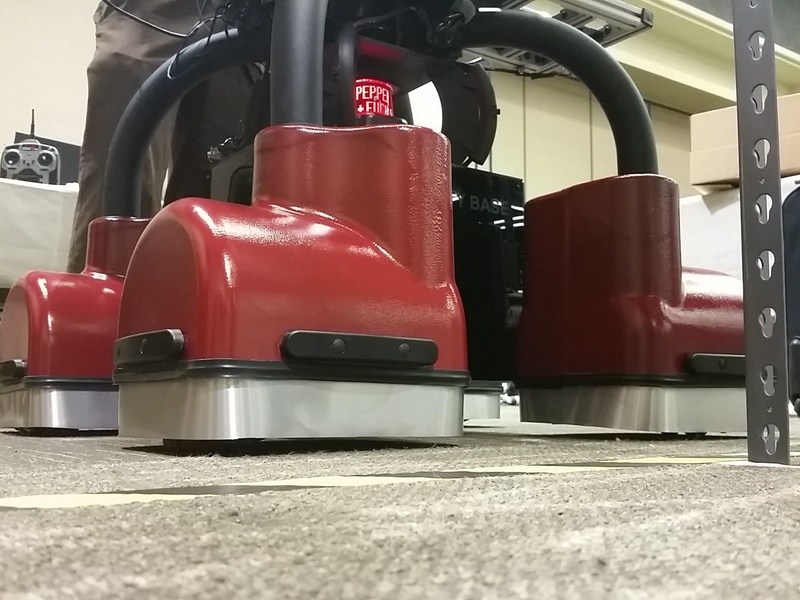 It can move autonomously and avoid obstacles. A lot of theory went into the PCB design and electronics’ circuitry, creating and integrating the drive control, generating the path planning for the robot to travel, interpreting and filtering sensor data, and building a pretty impressive control system to tie everything together! This photo depicts a two-dimensional infrared experiment being performed on a photo-catalyst in effort to assign infrared peaks of potential photo-products. The 400 nm handheld laser is implemented to generate the photo-products. Detailed information cannot be revealed because this work is not published yet. 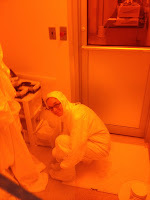 Third backup safety officer in the Kennedy group, Claire Ouimet, is simultaneously preparing to enter the clean room while also impersonating an Oompa Loompa. She is developing state-of-the art micro-fabricated chip electrophoresis devices in order to perform high-throughput screening of modulators of protein-protein interactions. Coincidentally, she is also 5'1" and orange.